At least 50 people were killed in Baghdad on Thursday by the Islamic State’s bombing and mortar campaign, bringing the total for the week to more than 160. The deadliest attack on mainly-Shia areas was a double car bombing in the Dolaie neighbourhood that killed 14 civilians and wounding 34 others. Angry residents threw stones at security checkpoints and police cars that arrived to respond to the blasts, prompting officers to withdraw from the area. The Islamic State said the attack targeted Iraqi soldiers and Shiite militiamen. In the eastern neighbourhood of Talibiyah, a suicide bomber rammed a car into a police checkpoint, killing at least seven policemen and five civilians. At least 28 other people were wounded. Six other civilians were killed and 16 wounded in another car bomb explosion on a commercial street in the northern Hurriyah district. In the northern Shula neighbourhood, six civilians were killed and 18 wounded by mortar rounds. 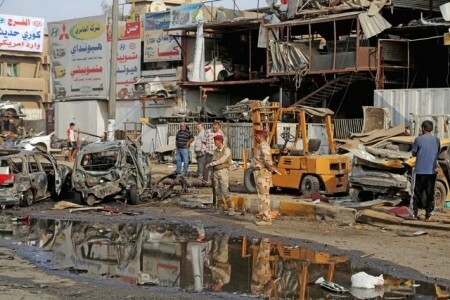 South of Baghdad, a car bomb in Mahmoudiya killed seven people and wounded 12 others, while a roadside bomb hit an army patrol, killing two soldiers and wounding four others. At least 162 people have been killed since Sunday by the attacks. NextSyria Daily, Oct 18: Has the Islamic State Been Defeated in Kobane?